Even so, from various comparative content reviews such as the one that was conducted by Nature.com in 2005 (as reported on Arstechnica, it would seem that the error rates of Wikipedia and Britannica were remarkably close, with Britannica only slightly in the lead: "Working from a statistically small sample of 42 randomly chosen science articles ... Wikipedia had 33 percent more errors, with 162 'factual errors, omissions or misleading statements,' as compared to 123 for Britannica. In terms of egregious errors involving inaccurately explained concepts or misinterpretations of data, the experts found four instances in each of the two encyclopedias." When you press "search" you get an on-screen keyboard to enter your search text (this is a little on the small side so those of us with fat finger syndrome have to be careful) and as you enter each letter a list of matches appears giving you a clue about possible hits ... nice. When you see a result that looks like it fits your query, you just press the on-screen entry with your finger to display the related content. Dragging up and down with your finger scrolls the content -- completely intuitive. 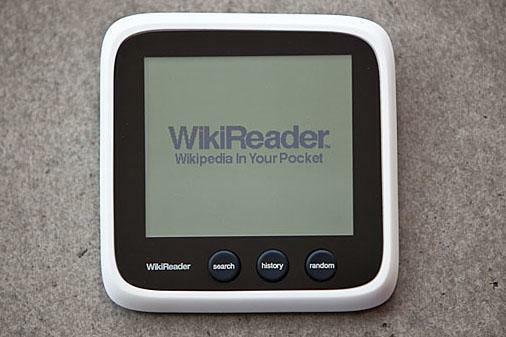 Priced at just US$99 the WikiReader can be updated, at no charge, by copying the latest content release to the micro SD card or, for the low price of just $29, you can receive two updates per year pre-loaded onto micro SD cards. What would improve the WikiReader? The next level up would be graphics, after which it would be audio then video ... all of which is asking for a lot of additional technology that would push up the price considerably.